It never ceases to amaze me what beautiful things come out of the ground. 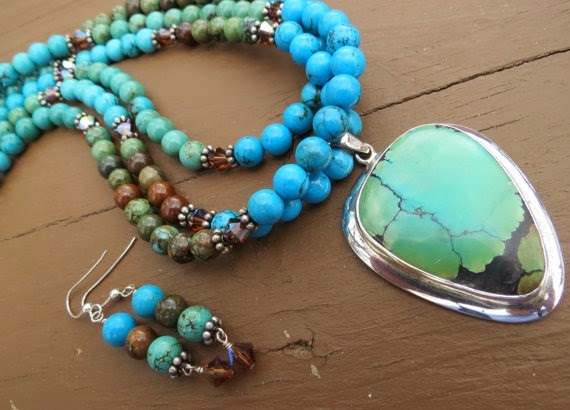 I first fell in love with Turquoise when I was a young girl. On a family vacation to New Mexico, my father bought me my first Turquoise & Silver ring. Then there is RED! Red Coral is also a favorite! Sparkle is a MUST!!! Whether it's a crystal or a rhinestone, better yet both! Then there is the intricate work of a lamp work bead or the beautiful color in a glass bead. The fun part is putting a variety of things together for a unique, one-of-a-kind necklace. No two necklaces are exactly alike!!! And in our opinion, what's a necklace without earrings?!!! All of our necklaces come with matching earrings. We do custom work too. Some of our local customers give us a blouse or dress to take home. We dive into our collection of beads and crystals for a set made to match! One friend gave me crystals from a chandelier that used to hang in her mothers house. And Granny gave me a fan pull, in the shape of a fish, that she had had for years. It's a lot of fun to use things like that. We're excited to be on Etsy and will be adding new items to our shop every week. We hope you have fun browsing through!! !